Home Hi-tech Analog vs. Digital recording? Which one is superior? Both Digital or Analog recordings transform sound signals into an electrical signal. While performing that, analog use different method to replicate the original sound waves than digital. They both try to be close to the original sound as much as possible. But which recording is superior to the other one? Analog or Digital? That’s a difficult question to answer. Which one way is a better way to represent the true essence of a sound? 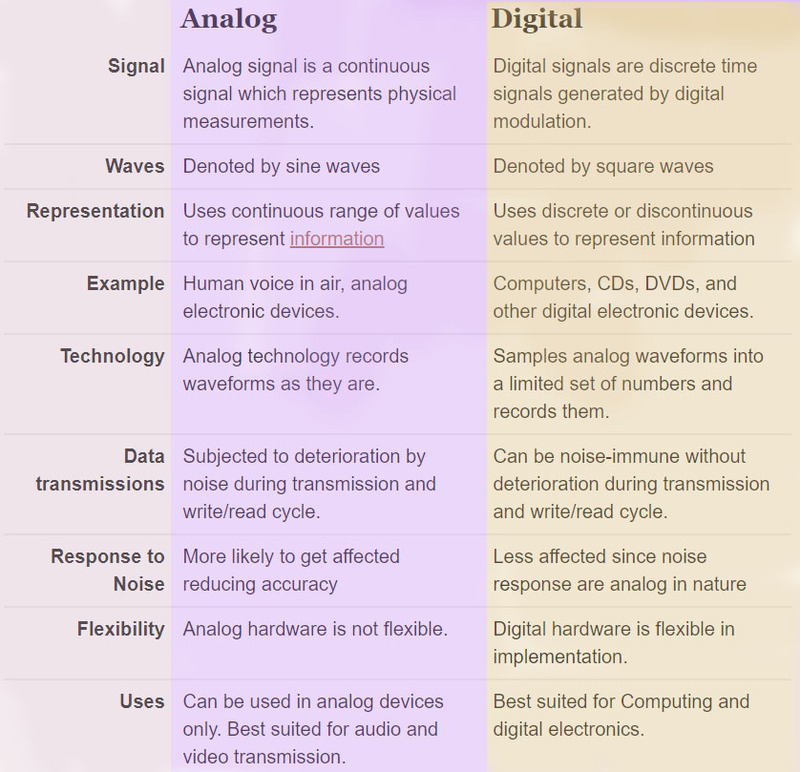 Digital or Analog? Vinyl and cassette tapes (magnetized tape) are examples of analog mediums for recording. 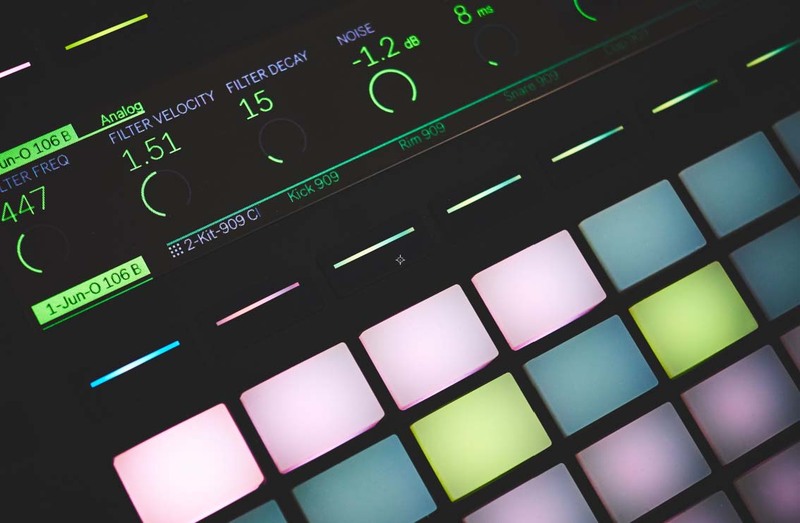 The analog mediums record the sound on an imprinted surface which has ups and downs. That’s why when we listen to vinyl, it has this tiny imperfection sound comes which cause cracking and popping noise. Digital system, on the other hand, exhibit cleaner audio by modulating the sound wave in a discrete method. Block of information arrives in a form of 1 or 0 coding system. The needle vibration sound problem is no longer there. However, because the sound hits in a composite of multiple layers (snapshots of a sound per second), it translates the information by bits and pieces. In the binary system of 1 and 0 of digital transformation, we lose some of the original sound waves. Another way to say, digital system reproduces better the original audio but fails when it comes to having the closest essence of a sound that analog produces. According to audiophiles, the purest sound originates from a vinyl recording, played on an analog sound system is the true essence of the sound. With today’s technology if you really want a high-quality sound system you need speakers, amplifiers, headsets, mixers etc. That will cost you definitely a fortune. Which image quality is better in cameras? Digital or Analog? 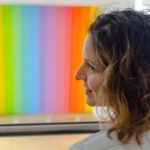 When it comes to visual image transmission, Analog vs. Digital competition comes back into play. The most serious disadvantage of analog signals in imagery compared to the sound is that analog image transmissions always contain noise. It means that when the image is copied or processed the ‘noise’ reproduces for the next generations. Charges from the pixels must be converted first to a voltage. This is done with a capacitor circuit. Then the voltage levels must be measured and converted to a number. This is done with the help of a converter. It is called analog to digital converter (A/D). A key advantage of a digital image, versus an analog image is the ability to make unlimited copies without any loss of image quality. Both CCD (Charge-coupled Device) or CMOS(Complementary Metal-oxide Semiconductor) camera sensors convert light into electrons. From 1960’s one colour charge band, CCD has become a major technology for digital imaging. CCD sensors are analog components that require more electronic circuitry outside the sensor. 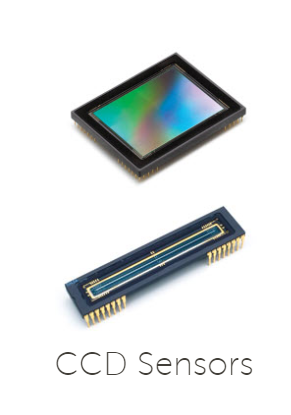 CCD’s are more expensive to produce and can consume up to 100 times more power than CMOS sensors. CCDs tend to be used in cameras that focus on high-quality images with lots of pixels and excellent light sensitivity. 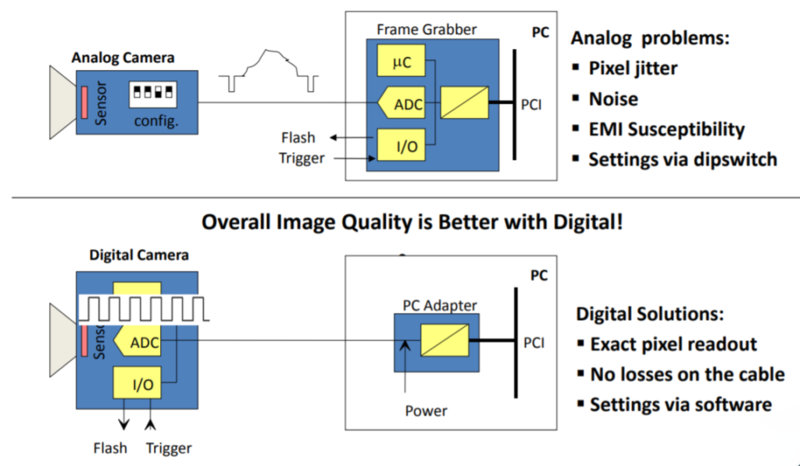 Analog CCD vs. Digital CMOS ? CMOS on the other hand, are produced in Silicon Valley. They are usually less expensive and have great battery life. The CMOS imager has a completely digital output. However, their sensors traditionally have lower quality, lower resolution, and lower sensitivity. Hence, each CCD amplifier has higher bandwidth, which results in higher noise. Consequently, high-speed CMOS imagers can be designed to have much lower noise than high-speed CCDs. 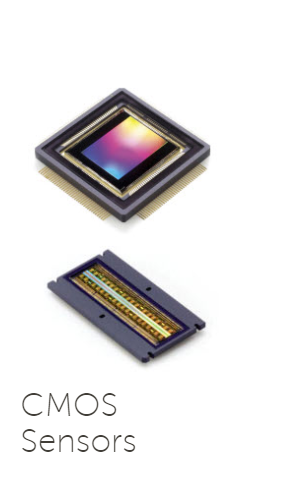 What about Tri-CCD vs Tri-CMOS ? Today, the technology is advanced. Therefore, if we compare the cameras with only one colour charge we see that it is replaced by three colour charge. But what does it mean? Cameras generally provide image quality based on how many optical colour separations they exercise. Today’s cameras are using three colour charges. Those are the ones, we call main colours: which is Red, Green and Blue bands. As a result, using digital cameras are a necessity more than a choice in terms of what they can provide. Such as more advanced features (Test Image, Stamp, Frame Counter, I/O Port Status, Error Checking, Partial Scan, Image Flip etc.) and higher resolution is not possible with analog cameras. However, using analog sound registration technologies is still a personal choice rather than a necessity. Bahar Elif Akyuz started her Political Scientist career working for NATO/SHAPE and for the European Union. After having 11 years of high-level diplomatic experience in Brussels (MA in EU Conflict Resolution/ Peacebuilding), she gives lectures to individuals on self-promotion and she produces audiovisual materials for NGOs in order to help them to better realize their campaigns. Bahar Elif Akyuz is also scenarist and a film director.